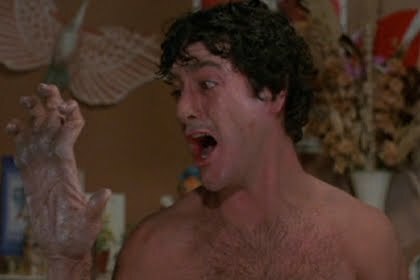 An American Werewolf In London retrospective – Winning. Words. The idea for American Werewolf struck Landis in 1969. Working in Yugoslavia as production assistant on Kelly’s Heroes, the 18–year–old future filmmaker stumbled upon a gypsy ritual in which a man was being buried upright in a deep grave, festooned in garlic to stop him rising from the dead. The ceremony struck a chord in Landis who, ever the thinker, wondered what it would be like to have to confront the undead. From this eerie encounter, Landis drafted the story of David, a young backpacker who is savaged one night by a vicious creature. It’s an assault that leaves his best friend Jack dead – but not for long, as Jack’s restless, gored spirit returns to warn David that he’ll probably find himself howling at the next waxing moon. His script, though, was to gather dust for over a decade. With its pitch black plot and incongruous wit, Landis’s odd little horror movie floundered in financial limbo, unable to bolster support. Two things finally got things off the ground. First, Landis hit the big time with National Lampoon’s Animal House and The Blues Brothers. Second, a British tax–break agreement called the Eady Levy meant that shooting in the UK was cheaper than ever – perfect for Landis’s London-set yarn. “Turns out mine was one of the last Eady pictures made,” the director recalls, after Margaret Thatcher stamped out the organisation. Now armed with a modest $10 million budget, Landis finally began to crank the cogs. Studio execs suggested Dan Aykroyd, whom Landis worked with on Blues Brothers, for the role of David. But Landis had his eye on a relatively unknown talent for his leading man – David Naughton, the face of the Dr Pepper television commercials. Such was Landis’s belief in Naughton – whose only other notable appearance was in an episode of TV’s Planet of the Apes – that he didn’t even ask the actor to audition. With other newbie Griffin Dunne cast as the undead Jack (the only other American actor in the strictly British ensemble), and sweetheart Jenny Agutter in place as David’s Brit of totty, Landis fleshed out the rest of his cast by hitting the London theatres – even drafting in Rik Mayall for a non-speaking role after seeing him at the Comedy Store. Work for Naughton was to begin almost immediately. The film’s most ambitious scene would end up being its defining moment – David’s torturous, graphic transformation from man to wolf. With special effects guru Rick Baker recruited to bring Landis’s feverish conjurations to life, Naughton went in to have casts taken a full five months before shooting began. Baker was also afforded more time to work on his gory creations thanks to American Werewolf’s ten week shoot which, unusually, was filmed in sequence, beginning with Wales standing in for Yorkshire. Filming took place both around London and in the Twickenham Studios, while the elaborate, destruction-heavy climax set in a chaotic Piccadilly Circus was also staged on location, with Landis’ film crew remaining one of the very few permitted to work at the prime London tourist trap – a liberty that Landis attributes to his way with the British police. “I put on a free screening of The Blues Brothers in the Empire Leicester Square and invited 300 members of the Metropolitan police,” the director reveals. “They loved it. And, whaddaya know, suddenly I had permission to shoot in Piccadilly Circus.” Shooting the sequence over two nights between one and four am, Landis and stunt coordinator Vic Armstrong worked the vehicular bust-ups like a military operation – so much so that the ambitious bus crash could be re-set and re-shot in mere minutes if needed. “Boy, we worked fast,” the director remembers. He even found time to play a cameo role as a man thrust through a shop window. On its opening weekend of August 21, 1981, American Werewolf took a not inconsiderable $3m at the US box office (at present, its total domestic gross Stateside sits pretty at $30.5m), but initial reviews were admittedly mixed. “The movie has sequences that are spellbinding, and then long stretches when nobody seems sure what’s going on,” remarked Roger Ebert at the time. Most praise was lavished on Baker’s ground-breaking special effects, which astounded the Academy Awards to such a degree that they created a new awards category – Best Special Effects – just so they could reward Baker for his pioneering work.